Super Savings Item! Free Shipping Included! 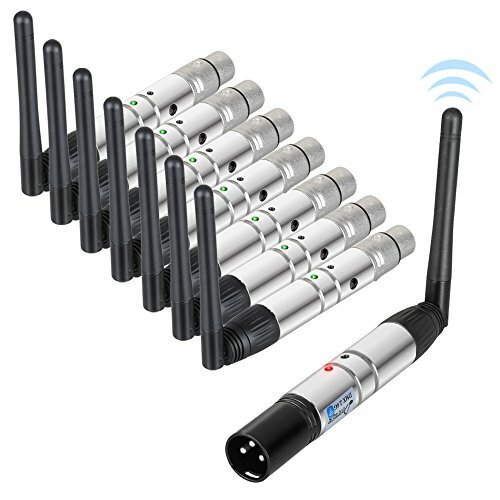 Save 31% on the Donner 8pcs DMX512 DMX Dfi DJ 2.4G Wireless 7 Receiver & 1 Transmitter Stage Lighting Control by Donner at IGWT. MPN: EC757+EC758x7. Hurry! Limited time offer. Offer valid only while supplies last. Specification:1. 2.4G wireless DMX512 R/T 2. 126 channels jumping frequency automatically, high anti-jamming ability, to ensure works reliability 3. 3. 7 groups ID code settable, User can use 7 groups individual wireless net without any interfere. DMX512 wireless receiver/transmitter transmits standard DMX512 protocol data (generated by console) by wireless way. No time delay when signal data is transmitting, signal data is real time and reliably. This product adopts a 2.4G ISM frequency section. High effective GFSK modulate, communication design; 126 channels jumping frequency automatically, high anti-jamming ability. If you have any questions about this product by Donner, contact us by completing and submitting the form below. If you are looking for a specif part number, please include it with your message.